The quality of service is supported through our Board of Director’s vast experience and personal commitment. Ka Hale Pomaika’i began as a grass-roots movement in 1996 and became incorporated in 2001. We have spent years working within the community to develop a local consensus around the appropriate strategy for addressing the plague of addiction to alcohol and other drugs on the island of Moloka’i. The Chairperson of Ka Hale Pomaika’i, Ms. Varna Nakihei (pictured above), has worked on the Federal Agricultural clean-up of the island of Kaho’olawe and following the close of that project, as a case manager for incarcerated adults returning to community from prison. She is the agency’s founder. 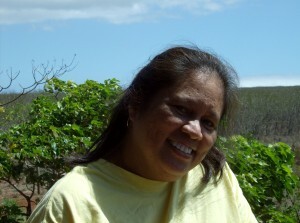 She is an active spokes person for recovery related issues in Hawai’i. Ms Nakihei is a long-term recovering individual born and raised on Moloka’i. She has developed several sober housing programs for recovering adults. 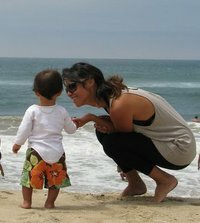 She is an active recovery advocate and public role model for Native Hawaiians in recovery. 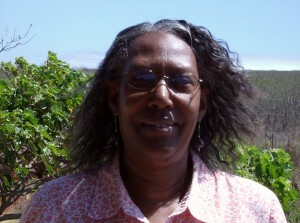 She enjoys being part of a Hula worship ministry on Maui and spending time with her family. She attributes her many successes to her strong spiritual belief in a Higher Power. The Co-Chair is a well known veteran’s affairs advocate and retired Honolulu Fire Captain. As a Viet Nam veteran, Wendell De Freitas (pictured above) learned business skills while in the military. He is now a successful property owner, managing and owning multiple residences that he rents. In the 1970’s, he was one of the members of the first crews of the Hokule’a, an open-ocean voyaging canoe which Hawaiians replicated after the ancient models that first carried Polynesians to and from islands. He has served KHP for many years. The Treasurer/Secretary is a paralegal employed by the Legal Aid Society who also serves as a Community Navigator. 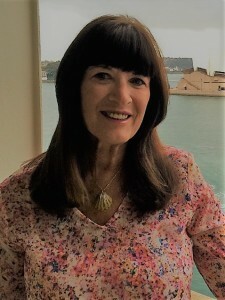 April Kealoha (pictured above) has been an active member of the Moloka’i community as a renowned Kumu Hula (Director and choreographer of a large Hula Halau). She and her husband are full time Taro, plant and animal farmers and successfully market their crops to large-scale events like the Hula Bowl football play-off. April has been active with KHP since 1996 and was an original founding Board member. She is the mother of two daughters and actively coordinates some of the largest fund raisers for their local elementary school. She is also active in her church. 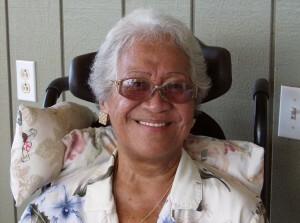 Pualani Akaka, MA (pictured above) serves the Board as its Recording Secretary. She is an experienced teacher on Moloka’i with 20 years in the DOE. 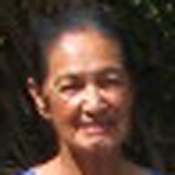 She recently held the position of union delegate for the local chapter of the Hawai’i State Teacher’s Association. She is a member of the allies in recovery movement as a concerned family member. She is the daughter of the highly respected late Kahu and Mrs. Abraham Akaka. She enjoys attending church, motorcycling and spending time with her son and his ‘ohana. John Aki (pictured playing the drums) serves KHP as a Member at Large of the executive board. He is a devout believer in a spiritual solution to the problem of addiction. He comes with a pastoral background and is a nationally known faith inspired musician. His personal triumph of overcoming his past is an example to many. Arizona Aki is a Member at Large. She is an elementary educator who teaches locally. She has dedicated her life to strengthening her community and family through her spiritual connection and faith. She is a creative board member who serves with a positive solution-focused attitude. 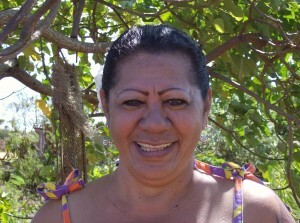 Helen Kekalia (pictured above) is a native of Moloka’i. She describes herself as a happy mother of 2. She studied in Chicago, Il and upon finishing her BA in Marketing, she returned home to Moloka’i. She well acquainted with the disease of addiction and would like to see a healthier Moloka’i community. She currently works in the marketing department of the Moloka’i Art Center. Na Kupuna: Our Wise Elders, Spiritual and Cultural Advisers. Our senior Kupuna of Ka Hale Pomaika’i, Luana Hamakua has left our earthly home to be with her Higher Power . She devoted much of her life since she retired from working with the Department of Education to the Hawaiian practice of conflict resolution called Ho’opono’pono. Aunty Luana was a Kupuna for the clients and staff of Ka Hale Pomaika’i. She was a skilled Native Hawaiian healer referred to as a La’au Lapa’au. 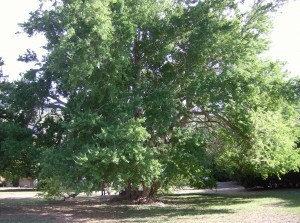 She used many Native traditional plants and methods for medicine. Her experience in these areas took her internationally as part of cultural exchange programs. She was with KHP since its beginning. 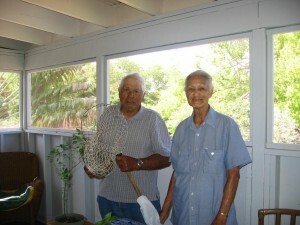 Our Local Mana’e Kupuna are Uncle Damien Place (pictured above), and his wife Aunty Marie Place (pictured below). They have been married over 50 years and are practitioners of La’au Lapa’au. Uncle Damien retired from cattle ranching and remains very active in local current affairs of the Island. He raises livestock and does welding. He and Aunty Marie provide invaluable help with all KHP activities as they reside right across the street! Aunty Marie is a mother of 9 with many grand and great-grand children. She is very skilled in the Hawaiian art and spiritual practice of La’au Lapa’au native healing. She is a strong leader for the Mana’e community on Moloka’i. She is the Po’okela for Kukui Kalani ‘o’ Lani’kaula, an ancient 800 year old Kukui grove. Executive Director – Administratively, Ka Hale Pomaika’i has secured Shari R. Lynn (pictured above with Wini the recovery dog) as Executive Director and clinical supervisor. Ms. Lynn is in long-term recovery (1987) and has been serving KHP since its inception in 1996. She first served as a volunteer and later in 2002 became staff. She holds a Master’s Degree (M.Ed.) from the University of Hawai’i- Manoa, secondary education license, is an internationally and locally Certified Substance Abuse Counselor (CSAC/ICDAC), Certified Prevention Specialist ( CPS), Certified Clinical Supervisor (CCS), Certified Transition planning Specialist (CTS) Certified Criminal Justice Addictions Professional (CCJAP) and a Certified Substance Abuse Program Administrator. She has extensive training in her career as a psychotherapist in the areas of sexual abuse/assault/offense, family dynamics, reactive attachment disorder, and addictions. Since 1995 she serves as the local responder for suicide crisis intervention on Moloka’i. Shari is a mother and grandmother of 4 mo’opuna. Her ohana resides on Moloka’i, O’ahu and the Big Island. She enjoys her family, Welsh Corgi, her farm and the ocean. Recovery Partners deliver outreach services to people who desire support to gain or maintain sobriety. 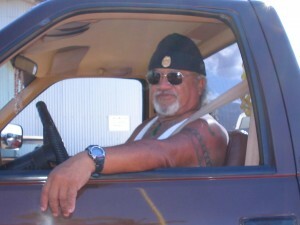 Recovery Partner Frank Lawelawe (pictured above) is a Native Hawaiian man in long-term recovery. He has participated in many youth under aged drinking projects. Frank facilitates recovery support groups and provides local-style outreach. He is a peer support mentor for adult men in early recovery. Frank is active in his church and is the father of 6 children on Moloka’i. He is the Motivational Enhancement Outreach staff at Ka Hale Pomaika’i and provides much of the transportation for the participants. Certified Substance Abuse Counselor (CSAC) and Certified Prevention Specialist ( CPS). 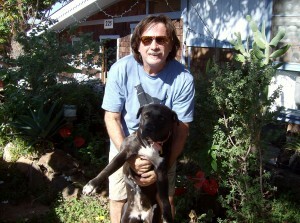 Tim O’Shaughnessy (pictured above with “Lana” the recovery dog…R.I.P.) has been active in his recovery since 1987. Tim is a long time surf board maker and artist. He currently serves as a group and individual counselor for Ka Hale Pomaika’i and often takes his groups to the ocean for classes. He also assists with assessments. Tim earned his Certificate in Substance Abuse Counseling from University of Hawai’i in 2000. He provides mentorship to men in early recovery through stand-up paddling while working the 12 steps. Nancy Poland , BS, MBA is the agency’s CFO, HR and IT. She serves as KHP’s full time fiscal officer. She earned her MBA while employed in a top IT position with a national aeronautical corporation. 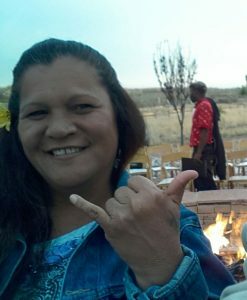 She and her extended ‘ohana reside on Moloka’i and own several micro enterprises which offer oceanic tourist activities. She is a wife, mother and grandmother. Amy Alvarez, PUBA is KHP’s administrative assistant. Amy also provides support, education, transportation and guidance for KHP’s pregnant and parenting women who are in treatment. She is a mother of 2 and owns her own business on Moloka’i. Her free time is spent taking care of her pet goats, dog and bunnies as well as assisting her family in their ocean adventure tour company. She also helps out with her daughter’s jewelry retail business on Moloka’i and O’ahu. She enjoys snorkeling and art. Wanette K. Lee, CSAC is one of KHP’s counselors. She provides both group and individual counseling for those with substance use disorders. She has a vast amount of clinical and cultural experience in the field. She has also worked with assisting victims of domestic violence. She was born and raised on Moloka’i. She is a mother of 7 and a grandmother. She is the full time care provider for her mother in Kaunakakai. In her free time, Wanette enjoys being with family, participating in her church and especially likes her outdoors paniolo activities.